Universal access to quality newborn health services will be essential to meeting specific Sustainable Development Goals to reduce neonatal and overall child mortality. Data for decision making are crucial for planning services and monitoring progress in these endeavours. However, gaps in local population-level and facility-based data hinder estimation of health service requirements for effective planning in many low-income and middle-income settings. We worked with local policy makers and experts in Nairobi City County, an area with a population of four million and the highest neonatal mortality rate amongst counties in Kenya, to address this gap, and developed a systematic approach to use available data to support policy and planning. We developed a framework to identify major neonatal conditions likely to require inpatient neonatal care and identified estimates of incidence through literature review and expert consultation, to give an overall estimate for the year 2017 of the need for inpatient neonatal care, taking account of potential comorbidities. Our estimates suggest that almost 1 in 5 newborns (183/1000 live births) in Nairobi City County may need inpatient care, resulting in an estimated 24 161 newborns expected to require care in 2017. Our approach has been well received by local experts, who showed a willingness to work together and engage in the use of evidence in healthcare planning. The process highlighted the need for co-ordinated thinking on admission policy and referral care especially in a pluralistic provider environment helping build further appetite for data-informed decision making. Global under-five deaths have halved in the past 20 years; however, reductions in neonatal mortality rates have lagged greatly behind other advances. Many global estimates exist for individual causes of neonatal morbidity and mortality, but do not provide information of sufficient granularity for understanding the number of cases expected to require hospital care. Without this information, local policy makers are unable to make informed decisions regarding health service planning and monitoring, limiting the potential for sufficient neonatal mortality reductions to reach the Sustainable Development Goals. To our knowledge, this is the first attempt to estimate the number of neonates requiring inpatient care for a specific African population that incorporates evidence, local expert views and extant thinking on local policy. Our estimates suggest that almost one in five newborns in Nairobi City County may need inpatient care. Local experts actively engage and provide important local policy and contextual insights to inform integrated thinking on health service planning, and demonstrate a desire to engage in the ongoing transition to data-informed decision making. We highlight the need for considerable strengthening and integration of health information systems and accurate, timely and granular analyses that should enable effective service provision and tailoring it to needs of high-risk areas. Before this is achieved, innovative use of available data informed by local experts may guide health policy and planning, enabling an important movement towards greater evidence-informed policy and service planning policy in low-resource settings. Ideally, data from comprehensive civil registration and vital statistics programmes, on health facility utilisation, and from cause of death notification should be combined to ascertain mortality and morbidity rates and access to services at a population level to support health policy planning.11 However, in many resource-limited settings, such information systems are weak and alternative approaches to harness data are required.12 In Kenya, attempts at collecting routine data from hospitals are ongoing through health management information systems, such as DHIS2.12 However, such routine data systems are limited by poor reporting, particularly from private-sector facilities, and absence of neonatal indicators.12–14 Additionally, they cannot capture information about neonates who do not access health facilities. Current systems need considerable strengthening and investment to allow for more accurate, timely and spatially granular data to improve service provision and tailor it to high-risk areas. In the absence of good local data, one possible approach could be to use local or regional estimates from the many global efforts to describe disease and mortality among children, including neonates.15 16 Unfortunately, although these approaches have been valuable for national and international agenda setting, they do not provide information at the level of detail required to understand the number17 of cases expected to need hospital care, limiting their usefulness to local policy makers and healthcare planning. Current estimates also frequently define a condition by presence or absence rather than level of severity that would determine requirement for care. Comorbidities are also often poorly described in the literature, making it difficult to differentiate the number of newborns needing hospital care from the number of incident episodes. In the absence of reliable local data or directly applicable estimates from the literature, we set out to work with a local expert advisory group to develop plausible and informative estimates of the requirement for inpatient neonatal care in Nairobi City County. We established an advisory group of senior clinical epidemiologists, senior Ministry of Health and County personnel responsible for child health, and neonatologists from public and private sector hospitals in Nairobi City County (n=10, see Acknowledgements section). The group met for a full day of consultations on four occasions to discuss neonatal conditions that would require inpatient care, with facilitation provided by a senior researcher to develop consensus positions where needed. National guidelines on neonatal admission policies do not currently exist in Kenya, with different health facilities following varying practices (Murphy et al, unpublished). Hence, we worked with the advisory group to define the population that requires inpatient services. Many conditions were identified that could result in inpatient care requirements. However, in an effort to minimise the uncertainty of our overall estimates and to take a pragmatic approach, we focused only on major conditions (figure 1). The conditions identified were similar to conditions identified in most international settings, including for example severe infection and neonatal respiratory diseases. The advisory group also considered relevant local policies and practices, such as new Kenyan guidelines that advise that all newborns with a low birth weight (BW) <2000 g should be admitted for kangaroo mother care. Other examples of local practice decisions are outlined in table 1. Terminology of conditions in the framework (figure 1) are defined in table 2. Admissions framework: conditions requiring neonatal inpatient care in Nairobi City County. The advisory group also agreed to exclude some conditions (shown in yellow in figure 1 and described as ‘miscellaneous conditions’ in table 1), for example uncommon congenital malformations and birth trauma resulting in fracture or acute anaemia, felt likely to yield imprecise estimates of incidence. Intrapartum stillbirths were estimated separately with the understanding that, as intrapartum care improves, some of these deaths may be avoided and, resultantly, a proportion of these surviving newborns may require inpatient newborn services. The advisory group also discussed and approved a classification of evidence: an order of relevance by which available incidence estimates for neonatal conditions should be considered for the Nairobi setting (see onlineappendix 2 table s1). The ideal (level 1) was agreed to be population-based estimates for Nairobi City County. In the absence of such evidence, categories were, in order of relevance, as follows: level 2, large population-based estimates from populations similar to Nairobi City County; level 3, systematic reviews of population-based studies providing national or regional estimates; level 4, individual population-based studies of populations substantially different to Nairobi City County; and level 5, facility-based studies. We conducted an iterative literature search up to 1 September 2015 using Medline, Embase, Global Health, Google Scholar and the WHO databases for incidence estimates for each of the selected conditions.17 We supplemented the search by contacting experts (see Acknowledgements section) for advice on published and unpublished literature, and by reviewing morbidity/mortality estimation papers from the Global Burden of Disease project and the accompanying bibliographies.18 19 Our aim was to identify the most relevant literature, guided by our classification and (see online supplementary appendix 2 table s1) advisory group. After classifying, we assessed our certainty in the derived estimates using the structured parameters of GRADE (‘directness’, ‘risk of bias’, ‘imprecision’ and ‘inconsistency’).20 To do this, we presented estimates derived from the literature to the advisory group for discussion, agreement on the certainty of the condition estimates (as high, moderate, low or very low confidence in the appropriateness of the incidence estimate for the Nairobi population) and selection of estimates to use in our final analyses. We followed the same process of literature review and expert group consultation to identify the likely overlap in estimates due to comorbidities. Where possible we adjusted estimates to ensure that newborns with multiple conditions were only counted once. For example, if a newborn had severe infection and was premature, we counted the newborn as needing one admission (either in the severe infection or preterm group). The specific approach to adjustment varied depending on the condition(s) being considered, these details are provided in the online supplementary appendix 1. We calculate that almost one in every five live born babies (183/1000 live births (lower and higher bounds of confidence: 148–221/1000 live births)) will require inpatient treatment in a newborn unit, where specialist care is predominantly focused on small and sick newborns in the first week of life. This number of newborns requiring inpatient care could vary from 149/1000 live births (126–176/1000 live births) to 207/1000 live births (169–249/1000 live births) depending on the specific admission criteria applied and the use of plausible lower and higher illness incidence estimates, respectively (see online supplementary appendix 2 table s3). The estimated neonatal mortality for Nairobi City County is 39 per 1000 live births21; thus, our findings suggest that of those newborns requiring neonatal care (183 per 1000 live births), 21% currently die within the neonatal period. The estimate of the total incidence of neonatal illness episodes for all selected conditions, without adjustment for comorbidity and double counting, was 223/1000 live births (183–266/1000 live births) (table 3). Hence, attempts to adjust for comorbidities reduced the estimated need for admissions by 18%. 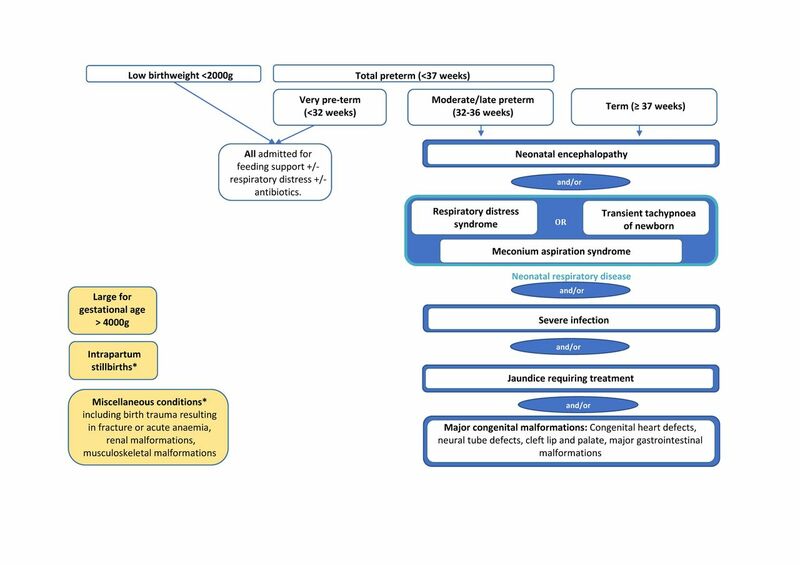 The leading causes of illness episodes were jaundice requiring inpatient treatment (predominantly in the first week of life) (73.9 (95% CI 67.1 to 81.2) per 1000 live births) and severe infection (62.0 (95% CI 41.0 to 83.0) per 1000 live births), accounting for 61% of the unadjusted estimate of neonatal conditions. Many of these newborns are likely to also have been preterm and/or BW <2000 g. Although not included in the overall calculation of newborns requiring admission, it was estimated that 10.2/1000 of births were intrapartum stillbirths. In the year 2017, the population of Nairobi City County is estimated as 4.26 million, with 132 025 live births occurring. Applying the estimate of 183/1000 live births, the total number of newborns in Nairobi City County requiring inpatient services is estimated to be 24 161 in the year 2017. Figure 2 shows the distribution of these newborn cases across the county by the administration unit of ‘location’. Under differing scenarios of admission (see online supplementary appendix 2 table s3), this number could range from 19 672 (149/1000 live births) to 27 329 (207/1000 live births). Distribution of newborns requiring inpatient care in Nairobi City County. The estimate of 18.3% of newborns requiring inpatient care was considered credible by the expert advisory group, but uncertainty around the estimate was acknowledged. The estimate for Nairobi City County is higher than those found in high-income countries.25–29 In their 2016 report, the UK National Neonatal Audit Programme estimated that nearly one in eight babies (approximately 12.7%) born in England, Scotland and Wales were admitted to a Neonatal Unit.28 Hospitals in the USA participating in the National Perinatal Information Center/Quality Analytic Services admitted 14.4% of newborns to a special care nursery (neonatal immediate care units and neonatal intensive care units) from 1 July 2009 to 30 June 2010.27 The higher number of newborns requiring care in the Kenyan setting is plausible given more limited antenatal care, and higher incidences of low BW and preterm births and of often preventable conditions, such as severe infection.4 15 30 31 Indeed a large part of our estimated need for care is due to infection and jaundice (together accounting for 61% of illness episodes), indicating that better preventive care, infection control and improved care for jaundice in community facilities or even at home could considerably reduce the need for inpatient services in the long run. No population-based estimates for Nairobi City County or similar populations were identified in the literature. Most of the relevant sources of evidence were either from systematic reviews of population-based studies, providing regional estimates for East Africa or sub-Saharan Africa (neonatal encephalopathy and severe infection) or facility-based studies (prematurity, BW <2000 g and jaundice requiring treatment). We obtained estimates of the incidence of neonatal respiratory conditions from individual population-based studies in European populations. Several sources of evidence were used to estimate the incidence of major congenital malformations; these included systematic reviews of population-based studies providing modelled estimates for Kenya, population-based studies from high-income settings and facility-based studies. Due to the lack of population-based estimates for Nairobi or similar populations, the certainty of all estimates was downgraded using the GRADE approach (see online supplementary appendix 2). Confidence in the estimates obtained from literature was further undermined by risk of bias (in particular facility-based studies that reported estimates for very preterm, BW <2000 g, jaundice and congenital malformations), imprecision (modelled estimates based on systematic reviews providing only regional level estimates with wide CIs) and inconsistency of estimates between studies (very preterm, BW <2000 g, jaundice and congenital malformations). Online supplementary appendix 3 provides further information on estimate specific limitations. Table 3 outlines the exclusion of overlapping comorbid conditions through adjustment. For many conditions, complete adjustment for overlap between estimates due to comorbidity was not possible due to limited availability of estimates of comorbidity in the literature. This limitation may have led to an overestimate of the need for admission, with some newborns being counted more than once, particularly among those comorbid for prematurity and BW<2000 g. It is essential that future data systems accurately capture comorbidity to aid with accurate understanding of care requirements. We have taken an innovative and pragmatic approach, encompassing local policy and practice, to providing information on burden of neonatal disease that can inform healthcare planning. Although limitations exist in the availability and quality of the data summarised for this purpose, before this analysis, the Nairobi City County government had no estimate of how much care may be required for their population, making our estimates a useful interim approach. As part of this process, we engaged with policy makers and healthcare planners at a local level in understanding the available information and its limitations, while also being sensitive to local policy. This engagement was valuable in its own right for demonstrating the need for careful thinking on policy (when and where to admit newborns), and recognition of the need for integrated thinking on health service planning, including referral pathways, that might span public, private and not-for-profit providers. Despite being at the forefront of healthcare planning and delivery, our experts had not come together previously to discuss these issues. It was clear that differences in practice across health facilities exist and there is a lack of clarity on policy for how neonatal care should be organised. As we have seen from our estimates (see online appendix 2 table s1) the number of newborns who should be admitted for care can vary widely depending on specific policies. Yet, the potential consequences of policy for the amount and type of care that needs to be delivered and the impact this might have on the overall organisation of services are typically ignored during the policy-making process. Universal access to quality healthcare and addressing high levels of neonatal mortality will be essential to meeting specific Sustainable Development Goals to reduce child mortality. Data for decision making are crucial for planning services and to monitor progress in these endeavours. Ideally, local population-level and facility-based data collection will, in the future, support accurate estimation of health service requirements. Initiatives to improve reporting rates and data quality, strengthen electronic data capture, and ensure data on neonates (and other neglected populations) are included in national systems should, therefore, be prioritised.12 39–41 There is an additional need to carefully consider how civil registration, vital statistics and health management information systems can be integrated, with linked investment in capacity to analyse and use these data. Before we achieve this, effective use of available data may guide policy and planning. Our approach has been well received by local experts, who showed a willingness to work together and a recognition of the importance of the use of evidence in healthcare planning in a resource-limited setting. These factors will prove important in the ongoing transition to data-informed decision making. We would like to thank the following list of people for helping with data sources: Alfred Osoti and Zahida Qureshi (University of Nairobi); Bernadette Modell and Matthew Darlison (University College London); Neena Modi (Imperial College London); Bolajoko O Olusanya (Centre for Healthy Start Initiative, Nigeria); Eric Ohuma and Jose Villar (University of Oxford); Finn Ebbesen (Aarhus University Hospital); Gorm Griesen and Rasmus Rogvi (Copenhagen University Hospital); Jalemba Aluvaala (University of Nairobi/KWTRP); Jesper Padkær Petersen (Aarhus University Hospital); Tanya Marchant, Simon Cousens, Sarah Moxon and Anna Seale (London School of Hygiene and Tropical Medicine); Maria Altman (Karolinska Institute); Naho Morisaki (National Center for Child Health and Development Japan); Pierpaulo Mastroiacovo (ICBDSR); Thomas Williams (University of Edinburgh); and Yngve Falck-Ytter (Case Western Reserve University). Countdown to 2015. A decade of tracking progress for maternal, newborn and child survival - the 2015 report: UNICEF and World Health Organization, 2015. United Nations. Sustainable Development Goals: Goal 3. https://sustainabledevelopment.un.org/sdg3 (accessed 26 May 2017).
. Levels and trends in the use of maternal health services in developing countries DHS comparative reports no. 26. Calverton Maryland, USA: USAID, 2011. Ministry of Health of Kenya Health Data Collaborative. Kenya Health Data Collaborative Roadmap. 2016 https://www.healthdatacollaborative.org/where-we-work/kenya/ (accessed 28 Mar 2017). Kenya National Bureau of Statistics. Kenya Demographic and Health Survey 2014. Nairobi, 2015. Kenya National Bureau of Statistics. 2014 Kenya Demographic and Health Survey (2014 KDHS. Nairobi, Kenya: Kenya National Bureau of Statistics, 2015. Nairobi City County. Nairobi Integrated Development Plan. Nairobi Kenya, 2014. Kenya National Bureau of Statistic. Exploring Kenya’s Inequality, Nairobi County. Nairobi, Kenya: Kenya National Bureau of Statistics, 2013. NHS National Sevices Scotland. Births in Scottish Hospitals: Information Services Division, 2016. Royal College of Paediatrics and Child Health on behalf of the NNAP Project Board. National Neonatal Audit Programme 2016 Annual Report on 2015 data. 2016. NHS England. Schedule 2 - The Services 2015. 2017 https://www.england.nhs.uk/commissioning/wp-content/uploads/sites/12/2015/01/e08-serv-spec-neonatal-critical.pdf (accessed 26 May 2017). African Population and Health Research Center (APHRC). Population and health dynamics in Nairobi’s informal settlements: report of the Nairobi Cross-sectional Slums Survey (NCSS) 2012. Nairobi: APHRC, 2014. Health Data Collaborative. Data for health and sustainable development. www.healthdatacollaborative.org (accessed 8 Aug 2017).
. Neonatal jaundice. London, 2010:1–495.
. Epidemiological Methods in Community Genetics and the Modell Global Database of Congenital Disorders (MGDb). 2016 http://discovery.ucl.ac.uk/1532179/. International Centre on Birth Defects. 2012. International Clearinghouse for Birth Defects and Surveillance Annual report 2012. EUROCAT. EUROCAT Prevalence Data Tables, 2012.
. Congenital anomalies in black South African liveborn neonates at an urban academic hospital. S Afr Med J 1995;85:11–16.
. Incidence of congenital malformation in 2 major hospitals in Rivers state of Nigeria from 1990 to 2003. East Mediterr Health J 2011;17:701–6.
. Congenital anomalies in rural black South African neonates--a silent epidemic? S Afr Med J 1995;85:15–20. GAVM and DW contributed equally. Contributors ME and GAVM designed the approach discussed in the manuscript with contributions from DW, RWS, DG and SS. DW conducted the literature review and analysis. POO and RWS provided expertise on geospatial mapping. GAVM and DW wrote the manuscript with substantial critical input from all authors. All authors read and approved the final version of the manuscript. Funding This work was supported by a Health Systems Research Initiative joint grant provided by the Department for International Development, UK (DFID), Economic and Social Research Council (ESRC), Medical Research Council (MRC) and Wellcome Trust, grant number MR/M015386/1. DW was supported by Oxford University Clinical Academic Graduate School (OUCAGS). RWS is supported by the Wellcome Trust as Principal Research Fellow (#103602) and ME by a Wellcome Trust Senior Fellowship (#097170). Data sharing statement Comprehensive supplemental material has been provided with this manuscript. If the reader requires any further information about the methods or literature review findings, they are welcome to contact the corresponding author. Collaborators Health Services that Deliver for Newborns Expert Group: Prof Aggrey Wasunna (University of Nairobi), Prof Fred Were (University of Nairobi/ Aga Khan University), Dr Catherine Mutinda and Dr Beth Maina (Pumwani Maternity Hospital), Dr Cecilia Mutiso (Mama Lucy Kibaki Hospital), Dr David Githanga (Kenya Paediatric Association), Dr David Kimutai (Mbagathi District Hospital), Dr Nancy Abuya (Nairobi City County/KWTRP), Prof Rachel Musoke (University of Nairobi), Dr Roseline Ochieng (Aga Khan University), Prof William Macharia (Aga Khan University), and Dr Rachel Nyamai (Ministry of Health).